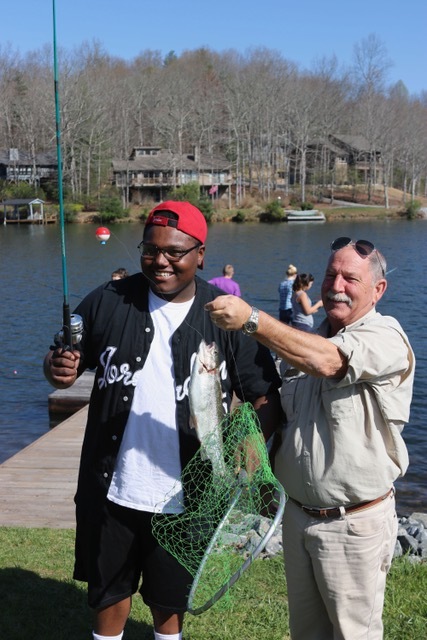 During the 2017 season the Fishing Club hosted 18 fishing events with a total of 320 participants, with the help of 25 Connestee volunteers. 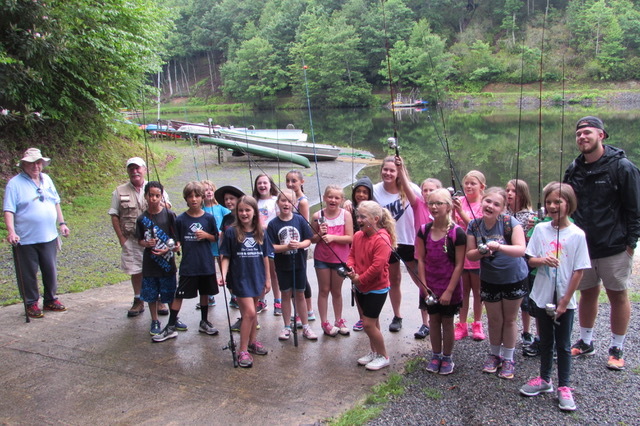 Participating groups included Black Mountain Home for Children, Special Olympics, TVS, Pisgah Wildlife/Goodwill Industries, Cedar Mountain House, El Centro, Boys & Girls Club, Sheriff’s Shield Camp, PARI, Bound for Glory Literacy Camp, 4-H, and Cub Scouts. New for 2017 was the formation of the Outreach Advisory Committee. Volunteers agreeing to serve on the initial committee were Jim Bailey, Chuck Dietsch, Carol Marines, Ted Migues, Emily Taylor (Boys and Girls Club Operations Director), and Nick Revill, Chair. We brought in Emily Taylor to foster closer communication with the constituency that Outreach serves. One of the committee’s major accomplishments was to develop a mission statement for the Outreach program: To impact the local community and develop positive relationships with diverse groups through fishing experiences. The Outreach Advisory Committee will play a critical role in helping to grow, refine and improve the program’s longstanding record of success. 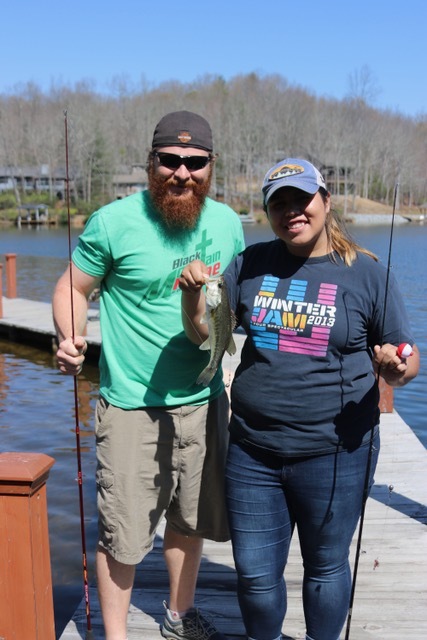 On Thursday, April 13th, the Fishing Club hosted the Black Mountain Home, which serves abused, abandoned, and neglected children from Western North Carolina. We had 14 foster kids at the event, ages 12 to 19 years old, who live in a home in Transylvania county. This is the first time the Club has hosted this group, and it was a great day for the kids and the volunteers. 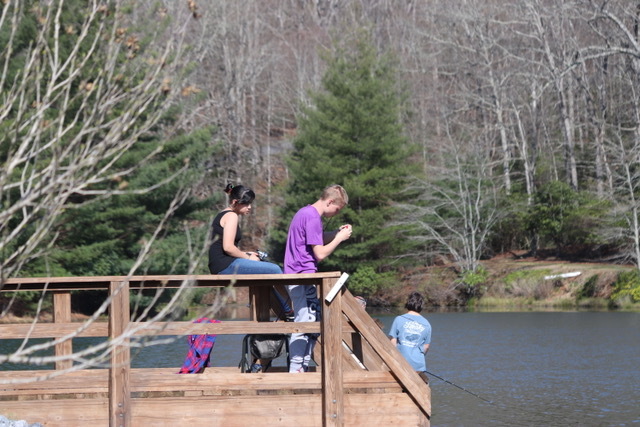 And the fishing at Atagahi Park was decent…….3 trout, 2 bass, and 3 sunfish. In the photos, the gentleman in the green t-shirt and beard is Dan Windmiller, the counselor that came with the kids. Dan was very very appreciative of what we provided to the kids. And the kids asked if they could come back for more fishing when they have a retreat at Whitewater Cove in November. 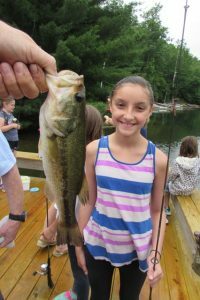 Outreach 2016 hosts 229 Anglers! The 2016 season schedule of events differed from 2015’s, as we worked to expand Outreach, building on our track record and seeking out new clients. Thus, the Transylvania County Sheriff’s Shield Camp and Brevard Elementary School joined our program this year. We have been and still are trying to work with the underserved in Transylvania County. It is our hope that next season we will also add Brevard Middle School to the Outreach calendar. George Hewertson came on board to join Nick Revill as Co-Chair. George made a noteworthy contribution as all round ambassador to the program not to mention steadfast volunteer. We have also been fortunate in that word of Outreach began to spread within Connestee, attracting first-time, enthusiastic volunteers who have pumped new life into the organization and a fresh perspective. Together, we will move forward into the future. 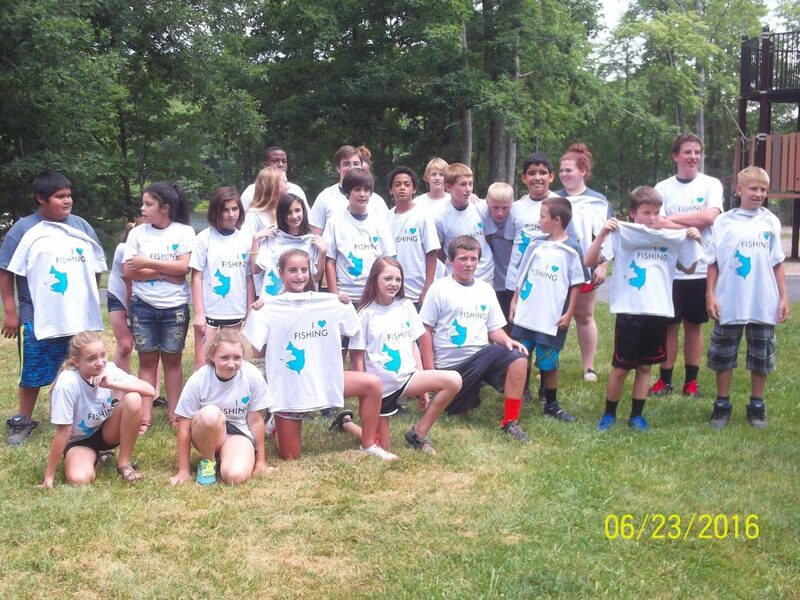 New this year, we also designed and printed t-shirts, which we give to each participant in groups that include Transylvania County residents of school age. The hope is that these tee’s will be seen about town and help promote the work and enhance visibility of Connestee Falls Fishing Club in the community. Regrettably, as of this year, we no longer had Brian Center on our schedule. Cedar Mountain House declined our invitation this year, staff explaining that the current residents were not motivated to go on outings. There are more groups out there that we can serve, and we have agreed to work with Kevin Howell at Davidson River Outfitters to identify folks who can benefit from the services we offer. Many, many thanks to all our established and new volunteers—a record 28 volunteers came out to help make the 2016 season such a success. Your names are highlighted at the end of this report. Without you, our work would be impossible, not nearly as much fun, and the 229 anglers we hosted would not have had such rewarding outings. Here’s to happy, healthy and satisfied fisherpeople! Beautiful morning. Seven anglers: 8 fish caught, 1 trout and 7 bluegill. Pete Pepinsky delivered a tribute to the late TVS angler Jeffrey Liebolt. Picnic lunch at pavilion. Anglers were enthralled by model radio-controlled seaplanes, which were being launched from one of the floating docks. This is a special interest group of 4-H. A light breeze that stiffened in advance of a cold front. 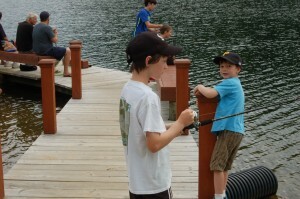 Eight anglers accompanied by six parents for the event held on a Saturday. Action very slow possibly due to the impending weather change. The older children persevered, but eventually the lure of picnic lunch and the playground proved too much. Catch: 4 bluegill and 1 fine perch. Seven anglers, some quite severely disabled but, nevertheless, enthusiastic. This group needed more care than most but were pleasant to host and appreciative. They were also remarkably self-sufficient. Action was again slow, netting them just three bluegill and one bass. 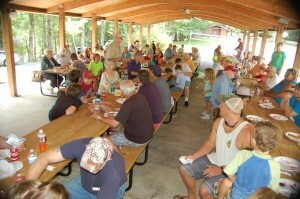 Eventually, lunch became the dominant interest, and everyone trickled up to the pavilion. Initially a hot and windless morning. Mercifully a breeze whipped up around 10:30 a.m. Ten anglers with four chaperones. Fishing was again poor. Earlier in the morning we saw lots of bluegills and some bass, which potential catch promptly decided to disappear when client fishing commenced. The catch was a paltry three bluegill, but we were again saved by the spectacle of radio-controlled toys in the form of a sailboat and a float plane that provided much entertainment. As ever, lunch beckoned, and everyone retired to the pavilion. Coffee and Danish were on hand for volunteers, delivered by Clubhouse staff. Very low kid attendance compared to previous Fish-a-Rama outings—a mere 16 anglers with a generous complement of 10 Club members volunteering. As is customary, Fishing Club provided tackle and bait, which for 2016 included crickets as well as worms. Twelve fish were caught: 10 bluegill, 1 trout and 1 bass. Marian Wolf distributed four t-shirts to the winners. As Ray Tuers slaved over a hot grill and hot dogs, Marian rushed into town to augment our cole slaw offerings. Volunteers, parents, grandparents and anglers were served lunch. Unfortunately, three rods and three of our newly purchased reels were stolen during this event—a sad reflection on our world today. On the positive side, an anonymous angel, a Connestee resident not a current member of Fishing Club, came to us, offering to replace the items lost. Fishing Club accepted the offer with gratitude. The continued viability of this event asks for re-evaluation after next year’s experience, and perhaps the criteria for awarding of “Champ” t-shirts also needs to be reconsidered. Boys & Girls Club outings are scheduled for a 9:30 a.m. arrival, because the kids have breakfast at their club before coming to Connestee. A fine morning with enthusiastic young anglers. George took aside those kids who had never fished and gave a fishing primer, which we now do on a routine basis so that our clients have some level of comfort. We had 16 anglers who caught seven bluegill. Twenty-four anglers arrived with Lt. Stroup and other Sheriff’s staff in police cars and SUVs, hauling with them a trailer full of barbeque accessories and sports equipment. Not much could go wrong with a group like that. The kids were well-behaved and obviously really happy to be here. Fourteen bluegill and one perch were caught. Then, the kids headed up to the pavilion, where the sheriffs cooked them burgers with all the trimmings for lunch. These were kids from all over Transylvania County who have been identified as having leadership skills but who are also considered potentially at risk. After lunch, they played ball and swam in the lake. That they had a good time was confirmed by one of the mothers I am acquainted with, who told me that her son said he had the best time ever! Another fine morning. Fifteen kids emptied out of the bus competently shepherded by Emily and her assistant, Brandt. Fishing really picked up with 15 bluegill, three bass and one trout caught. Lunch was served, and the kids used the playground equipment. P.A.R.I. is one of the settings for Duke University’s TIP program of summer studies for gifted children. Our outreach for brainiacs, these kids came from all over the country with some from overseas. We had 27 anglers and five chaperones. It was an extremely hot morning, and the kids for the most part were not as engaged as last year’s group and much harder on the tackle. Some of the chaperones seemed less than keen on the outing, but perhaps that was also an effect of the heat. Despite this, our catch comprised ten bluegill, four bass and two trout. The group also came supplied with foodstuffs, sun screen and bug spray. Despite unfavorable conditions, our 16 anglers caught 16 bluegill, 4 bass and 2 trout. At lunch when the t-shirts were distributed, they were received with much thanks and pleas to be allowed to change into them. This was a young group of anglers, ages 9-11. Despite unexciting fishing, this group was super patient and seemed genuinely happy when one of their number caught something. Our 17 anglers caught four bluegill and 1 bass. Some of our teen groups could have learned from these youngsters. More intellectually challenging anglers—27 of them accompanied by five chaperones. The morning was as hot as Hades, but the anglers kept at it and ended up with 13 bluegill and one bass. These kids were high maintenance. They went through worms at a blistering pace, and their ability to create tangles, hook trees, the dock, and even the roof of the covered dock was nothing short of astounding. They did, however, enjoy themselves. A hot, dry morning with a storm on the way. Despite having asked Mary to bring a decent-sized group, she arrived with only three 4-H’ers. She said that on future outings she would have more participants. 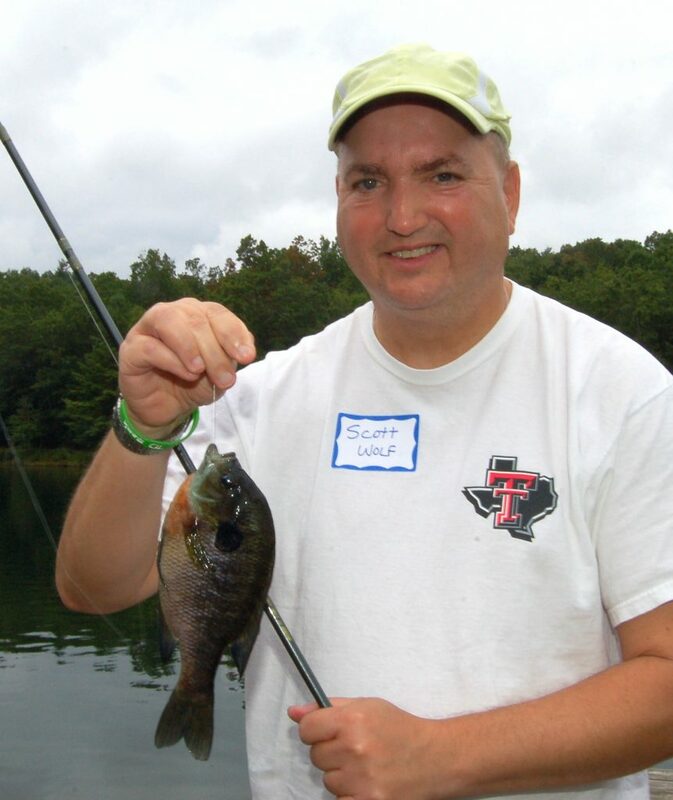 A total of five bluegill were caught. Mary sent a nice letter of thanks, accompanied by photos of the outing. Group Leader: Jennifer Rowe (a Connestee resident), accompanied by her mother, Sally. The Goodwill group brought by Pisgah Wildlife Center originates from Asheville and generally arrives after 10:00 a.m. Eleven anglers arrived very late, so we allowed them extra time. This group had problems ranging from Tourette’s Syndrome to physical disability. The fishing was nothing short of dismal. We landed one very good-sized bluegill. Rick Hybil had hooked the fish and handed over the rod to the keenest angler to bring it in. The team leaders told us that everyone had a good time. Just being outside makes them happy. Over time, they develop a sort of institutionalized agoraphobia. We noticed that by the end of the session, they seemed to have gained some confidence. At the outing’s outset, a number of them were too uncomfortable to go onto the dock, but by the end everyone had congregated there. This was an experiment by both sides. These children were from the K-5 Day Treatment Program. They have been judged to be unable to function in a traditional classroom setting and have emotional and/or anger management issued caused primarily by unstable home situations. Three kids arrived, and I met them at East Fork Gate and guided them to Atagahi. They were accompanied by four administrators, who are behavioral experts and clearly wanted to observe our program. The kids were cooperative although not focused. One young man was so interested in the fish swimming around the dock that he decided to join them by falling off the dock. We heaved him out and toweled him off. With Ted Migues’ help, he was able later to land a respectable bass. Our sense is that we will have repeat events with this group. Group Leader: Parents and guardians. 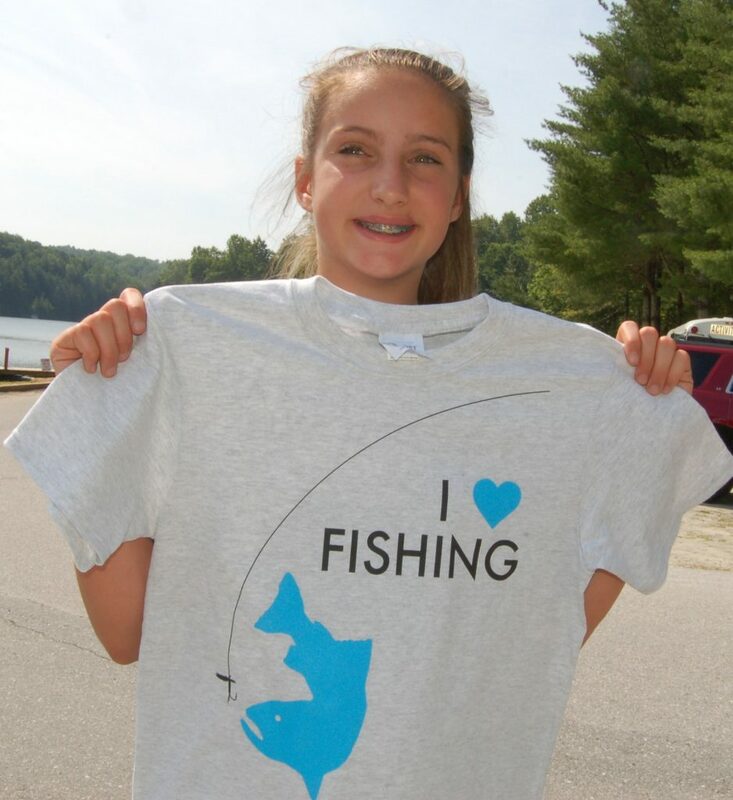 We had a total of 22 anglers and distributed 20 t-shirts, which were a big hit and have been seen in Connestee and around town. The weather was kind to us. The fish, on the other hand, were not. Our catch amounted to a disappointing four small brim. Of course, we have to mention that the time of day—1:30 to 3:30 p.m.—was far from ideal. We also had to clear the area of swimmers. Despite all this, everyone seemed to have a good time. Frank and Marian Wolf, who hosted the event, provided snacks and post-fishing games and entertainment.It was nice to see the camaraderie that both athletes and parents shared. Success comes in many forms, and, as we have seen throughout the season, is not measured only by the tally of fish caught. Nancy Carson, Pete Pepinsky, Patti Consoli, Nick Revill (Co-Chair), Chuck Dietsch, Bill Roehrich, George Hewertson (Co-Chair), Steve Seelinger, Gillian Hillman, Ken Stark, Rick Hybil, Bob Stebbins, Cheryl Inghram, Ray Tuers, Peter Lindsay, Jim Ungaro, Carol Marines, Ed Wallick, Ted Migues, Marian Wolf. 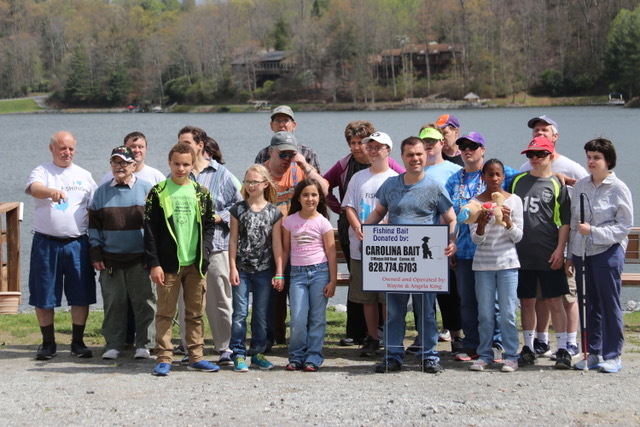 During the 2015 season, Outreach provided a fun fishing experience for 270 children and elderly adults, with participants from a variety of organizations including Transylvania Vocational Services, 4-H, Special Olympics, Cedar Mountain Home, Fish-A-Rama, Boys & Girls Club, P.A.R.I., and Pisgah Wildlife Resources. Nick Revill was the Co-Chair of the 2015 Outreach Program–and the backbone of the whole operation. When Nick joined the Fishing Club and informed Ken Stark that he wanted to be involved in Outreach, it came as a real blessing. Nick’s contribution as Co-Chair was so highly regarded by our volunteers and participants that he was the obvious choice for the 2016 club Vice President. The Outreach Program relies heavily on the wonderful help of its club members who served as Volunteers during the fishing events. Nick and Ken find it hard to thank these dedicated and loyal helpers adequately. Their tireless efforts made the 2015 Outreach Program a wonderful success, as it always has been in previous years. It is a privilege to name several of our most valued Volunteers: Pete Pepinsky, Gillian Hillman, Rick Hybil, Frank Wolf, Marian Wolf, Ray Tuers, Ed Wallich, Bill Roehrich, Nancy Carson, Doris Wilson, Val Gerdes, George Hewertson, Dave Kuhn, and Mike Milts (and, of course, Nick Revill and Ken Stark). Thanks to all who helped make the 2015 Outreach program such a great success! 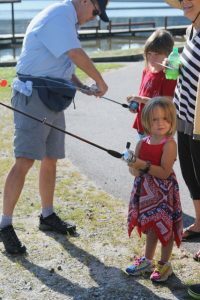 More than 40 children signed up for the Fish-A-Rama fishing contest, accompanied by nearly double that number of parents and grandparents, on a sunny Saturday in Atagahi Park June 20. 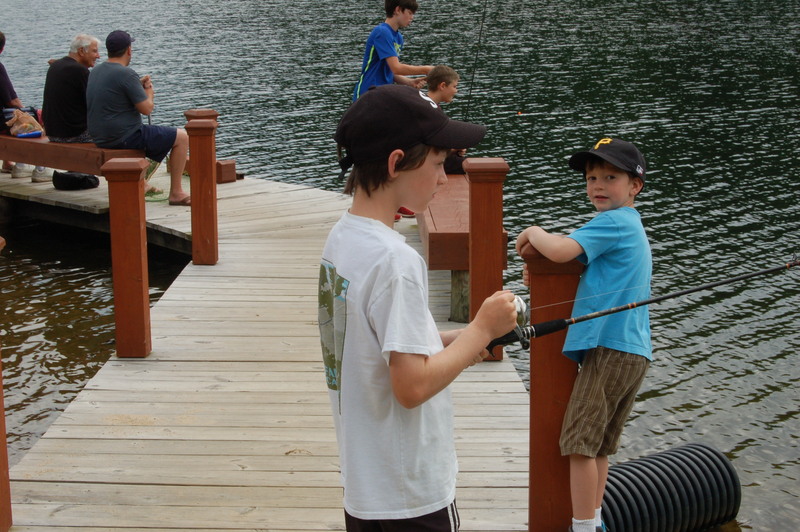 The fishing was less than spectacular – just 16 fish were caught – but everyone said they had a good time anyway. After the contest, Club volunteers put on the traditional free lunch… hot dogs and all the trimmings. Frank and Marian Wolf organized the annual event and enlisted a cadre of helpers. Doris Wilson and Nancy Carson resumed their traditional role at the registration table. Larry and Gail Alsobrook oversaw the food supply. Then Club Vice President Ken Sharp and Nick Revill, who co-chair the Outreach Program, headed up the list of waterfront helpers, who also had the job of measuring and recording the catches: Bill Foley, Gillian Hillman, Rick Hybil, Pete Lindsay, Steve Martin, Pete Pepinsky, Bill Roehrich, Mike Rothman, Steve Seelinger and Ed Wallick. 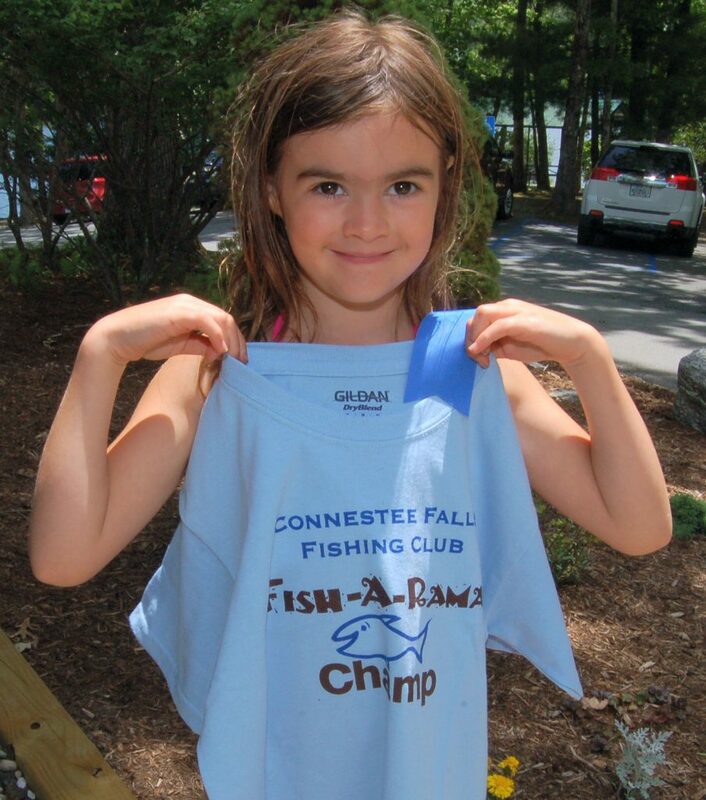 In the age 1 to 6 group, Nisha Mooney, 6, won both the biggest and most categories with an 8-inch bluegill. No one else in the group caught a fish. 7 to 9 – Coy Craig, 9, won for the biggest, an 11-inch bass. Dannie Joe Migues won for the most, two bluegills. 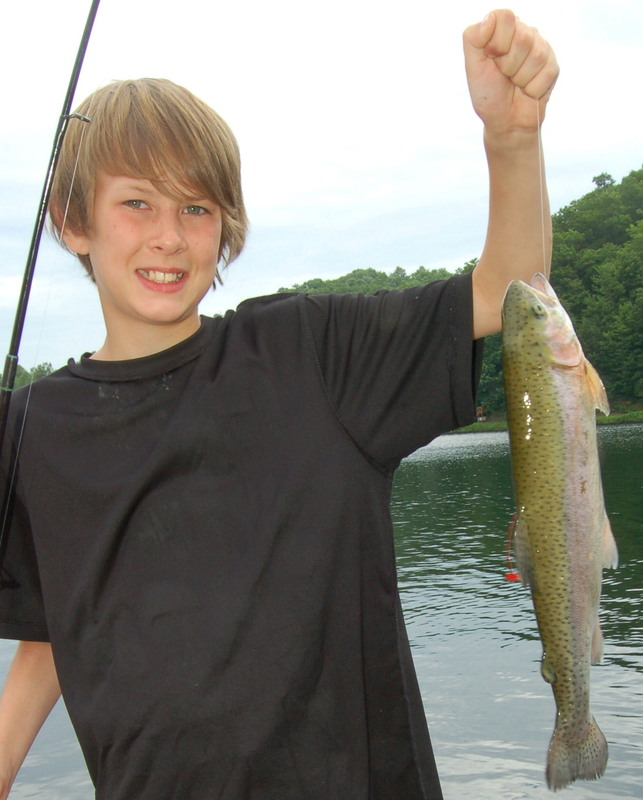 10 to 12 – Ethan Motts, 10, won for the biggest, a 16-inch trout. Liam Davis, 10, won for the most, two bluegills. 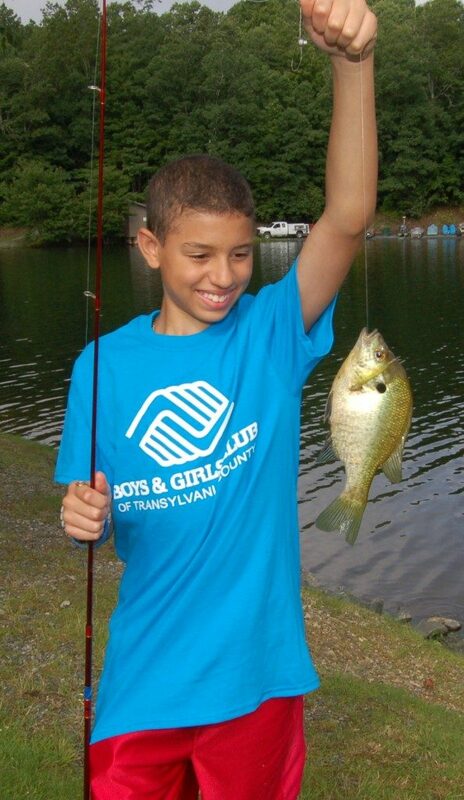 13 to 17 – Alec Kolstedt, 14, won for the biggest, a 7.5-inch bluegill. 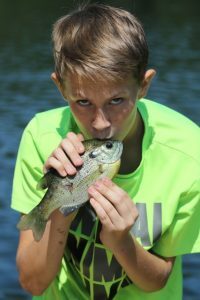 Zachary Kolstedt, 15, won for the most, two bluegills. Forty delighted children crowded the shore of Lake Atagahi on a sunny, mild Saturday June 22, 2013 for the Club’s annual Fish-A-Rama. More than that number of adults – parents and grandparents – rooted them on in the children’s fishing contest that ran from 9 a.m. to noon. Afterwards, the crowd of more than 100 feasted on a free hot dog lunch with all the trimmings. For a peek at what happens at a Fish-A-Rama use the link below to watch the video of this event prepared by member Ron Kolstedt.